Crawl spaces can easily be forgotten and neglected and can, unfortunately, impact the inside of your home. At Stable Foundations, our crawl space waterproofing solutions can turn your wet, nasty crawl space into a dry, healthy, functional space! What Causes Crawl Space Water Damage? Crawl spaces are susceptible to many issues if they are not well maintained. There are many different factors can cause water damage and require you to seek a crawl space waterproofing solution. The most obvious cause of crawl space water damage comes from rainwater flooding. As heavy rain pours down, it can quickly and easily flood your crawl space if the proper waterproofing systems are not in place. Crawl spaces are not designed for air circulation. They can easily trap air inside and become stagnant over time. As humidity builds up during the summer months, this moist air can cause the humidity to turn into condensation and result in water damage. Water is a powerful force and can easily seep through even the tiniest of cracks. If you have any large or small cracks in your crawl space walls, water will find its way in and cause damage in your crawl space. Some symptoms are more subtle than others and have the potential to be very dangerous to your health. If you notice any major or subtle signs of water damage, it’s best to contact us right away for a free inspection for our crawl space waterproofing solutions. Since most homeowners don’t spend a lot of time in their crawl space, they’re easy to forget about. Unfortunately, the damage in your crawl space isn’t contained to that area and it can impact the inside of your home. The stack effect is what causes the air inside your crawl space to infiltrate the air inside your home. If the air inside your crawl space is musty from water damage, it will eventually work its way upward and create musty odors inside your home as well. As water sits in your crawl space, the moisture can weaken your floor joists and cause structural damage. The water can also cause mold to grow, which can cause your wooden floor joists to rot and create structural damage in your home. A dry crawl space is a clean and healthy crawl space. Our waterproofing solutions will help keep your crawl space dry and prevent any water damage from impacting your home. At Stable Foundations, we use the Hydraway® Drainage System where a sump pump is installed to direct water away from the crawl space. Hydraway® systems guide excess water to a sump pump and push it away from your home’s foundation to prevent damage. A backup solution, in the form of a backup battery case and charger, is also recommended to ensure continuous operation. The Hydraway 2000 removes up to 70% more water than conventional rock and pipe “drain-tile” systems and never clogs. 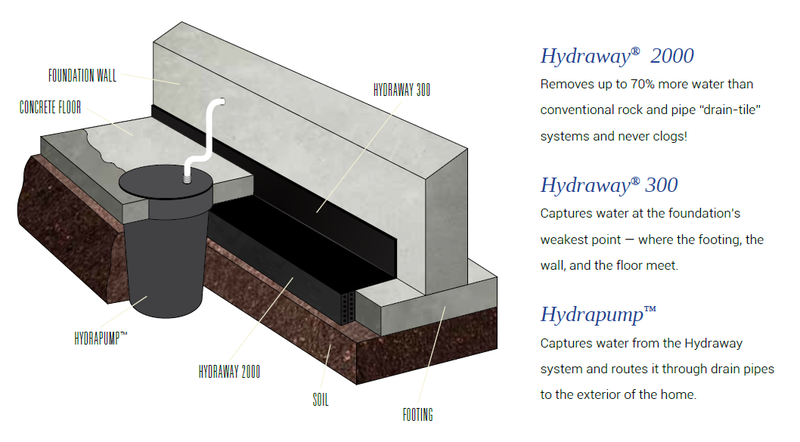 The Hydraway® 300 captures water at the foundation’s weakest point where the footing, wall, and floor meet. The Hydrapump® captures water from the Hydraway® system and routes it through drain pipes to the exterior of the home. Our waterproofing solutions not only benefit your crawl space, but also protect the rest of your home from more extensive damage. We have proudly helped customers throughout the Virginia area with crawl space waterproofing solutions for over 25 years. As a third-generation company, we take pride in our customer service and work diligently to provide the best possible solutions to protect your home. Contact Stable Foundations for all your crawl space waterproofing needs.